Different colour homemade hot sauce in glass bottles. 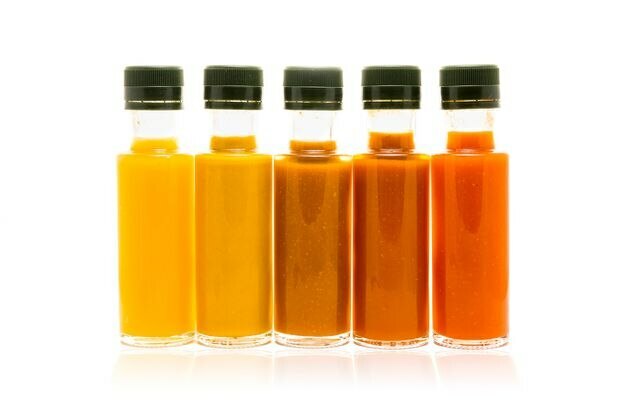 Yellow, brown, mustard and red chili sauces made with bio-eco ingredients. For Al Bourbouhakis, it started with a hot-pepper overrun in 2015. Bourbouhakis was a chef at Tomlin, a restaurant in Thunder Bay, when a farmer delivered an extra few hundred pounds of peppers. Bourbouhakis and his partner Nancy Shaw didn’t want the produce to go to waste, so they started playing around with different recipes to make a hot sauce for personal use. They chose to ferment the peppers as a way of preserving them and loved the results enough to serve it at the restaurant. Soon, the hot sauce – a medium heat with a sweet and fruity edge – became a hot commodity around town, so they began jarring it and selling it locally. They called it Heartbeat, branding it with a simple black and white label that differentiated the product from the more kitschy sauces on the market. The couple went to county fairs and pop-ups to sell their sauce and within a few years, it had morphed into a full-time job. “If you had told me then that I would be making hot sauce for a living, I wouldn’t have believed you,” says Bourbouhakis, who sold approximately 100,000 bottles of hot sauce in 2018. Heartbeat is part of a growing offering of artisanal hot sauces that are taking over tables in restaurants and homes. The makers of these new condiments take hot peppers and turn them into something more than just a flaming burn – they are producing sauces that aim for flavour, balance and heat. Part of the allure of hot sauce is biological. Chili peppers themselves aren’t addicting; it’s the body’s response to the onslaught of heat that brings the diner back over and over again. The capsaicin in chili peppers binds with the receptors on our tongue, which convinces the brain that the tongue is on fire. Chili peppers don’t actually burn your tongue, but the feeling is so convincing that the body goes into overdrive to put out the fire. The involuntary reaction is to sweat, cough and breathe heavily, which is followed by a rush of endorphins. It is this final step that makes people crave more heat. For a long time, hot sauces were all vinegar and fire with recognizable names and big marketing budgets. The first wave of hot sauces such as Tabasco and Frank’s Red Hot have been around since the turn of the 20th century and were hot enough to rent permanent space on almost everyone’s fridge door. Asian-inspired Sriracha joined the market in the 1980s, building up its market share and people’s heat tolerance throughout the early 2000s, which got people talking about what a hot sauce with flavour could do. “People loved the feeling of heat and wanted more,” Chaimberg says – until they eventually tired of the macho one-upping of heat levels. Home cooks and professional chefs looked to their own cultures and around the world to learn how hot sauce could enhance food instead of dominating it, and started to make sauces that strived for balance instead of inferno-level heat. That’s led us to the third – and, to date, best – wave of hot sauce, Chaimberg says, a phase in which artisanal, small-batch-brewed sauces are in demand. Chaimberg is instrumental in choosing the hot sauces for the viral online hot-pepper show Hot Ones (as well as making the infamous Last Dab sauce familiar to its viewers). If there has been one element that’s boosted the profile of small-batch hot sauces, it is Hot Ones, which has celebrities such as Jeff Goldblum and Chrissy Teigen eating an array of escalating sauces as they are interviewed by host Sean Evans. The show regularly draws millions of viewers and has become both a booster and a community for “chiliheads,” Chaimberg says. The rise of artisan sauces comes at a point where, as a culture, our tastes are becoming more refined and international. We’re used to the heat of Thai chilies in our curry, and Scotch bonnet peppers in our jerk sauce. People are bringing home “memories of spicy dishes from their travels and want to spice up their dishes at home,” Bourbouhakis says. You won’t find a Scoville heat-scale rating on Bourbouhakis’s Heartbeat sauce, although the habanero pepper has a rating of about 350,000 Scoville units, approximately 10 times hotter than a jalapeno. Habaneros have a slow burn that builds as you eat them. Sauces often used to have the Scoville rating proudly displayed on the bottle, but makers such as Bourbouhakis don’t feel Scoville is a selling point, as they want the flavour to be as important as the heat. Those seeking the uberhots can find sauces with California Reaper and Triple X peppers at Heatonist and the Canadian online store HotSaucesUnlimited, where George Boncheff sells 20 different lines of Canadian sauces alongside hundreds more from other countries. Three years after the hot-pepper overrun, Bourbouhakis and Shaw make three Heartbeat varieties and employ four people in Thunder Bay, bottling the sauce for fans all over the world. Brodie Dawson of Dawson’s Hot Sauce in Hamilton also makes a habanero sauce and, like Heartbeat, his sauce was featured on Hot Ones. The Dawson’s Original sauce is hot, rich and fruity, which won over actress Charlize Theron on the show. Five years ago, Dawson was a musician, holding down a bevy of part-time jobs while making hot sauces in his apartment kitchen. For years, he gave them away to friends. Eventually, he began to professionally bottle and sell the sauces after he met Chaimberg at a hot-sauce show, leading to a feature on the Heatonist site.